I visited the Alsace region of France for a quick weekend over the American Thanksgiving holiday. I flew into Geneva, Switzerland and then took a train to Basel before transferring to a local train to Colmar, France. On quick trips such as this, I avoid car rentals. I prefer to take advantage of public transportation and the deluge of culture that accompanies it. 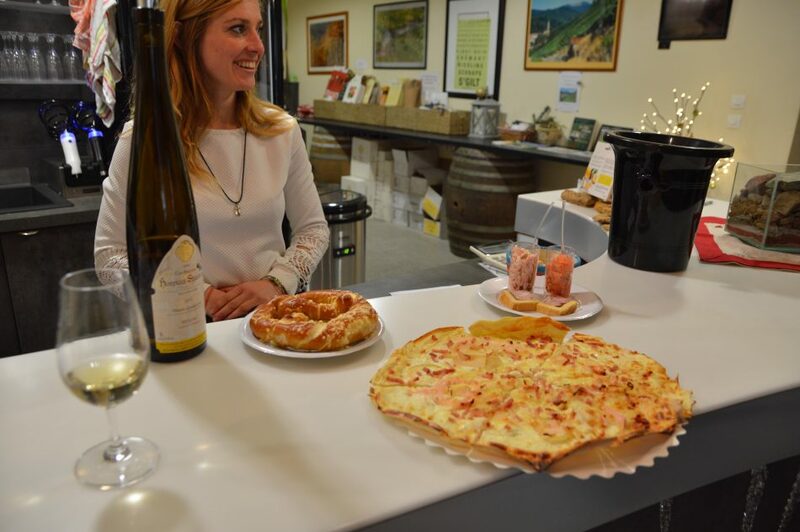 On this particular trip, I was really looking forward to trying the food and wine of Alsace. Today, it is a region of France. In the past, it has changed hands between Germany and France more times than I can count. I spent so many of my school days learning about the different regions of France, and Alsace was always a favorite. 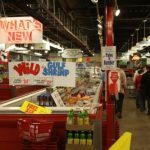 During my stay, I took food tours with two different companies. My time with L’Alsaciette so far exceeded my expectations, and blew the other tour company out of the water. There were countless reasons why my Christmas Market tour with L’Alsaciette were better than the other tour, but I’ll limit myself to six here. Agnès and Arnaud are the owners of L’Alsaciette Food Tours. While Agnès grew up closer to Lyon, her family was from Alsace and she spent much of her childhood here. 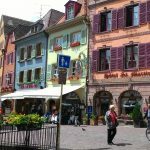 Arnaud is a lifelong Alsatian resident, moving from the mountain town of Munster to Colmar and various villages in between. 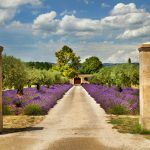 While they both had different careers in the past, their love of both travel and of their gorgeous region brought them to create a tour company. 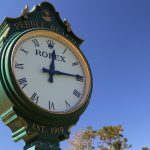 Have you ever been on a tour with a driver who doesn’t know where he or she is going? Yeah, it is terrible. This is not the case with L’Alsaciette. 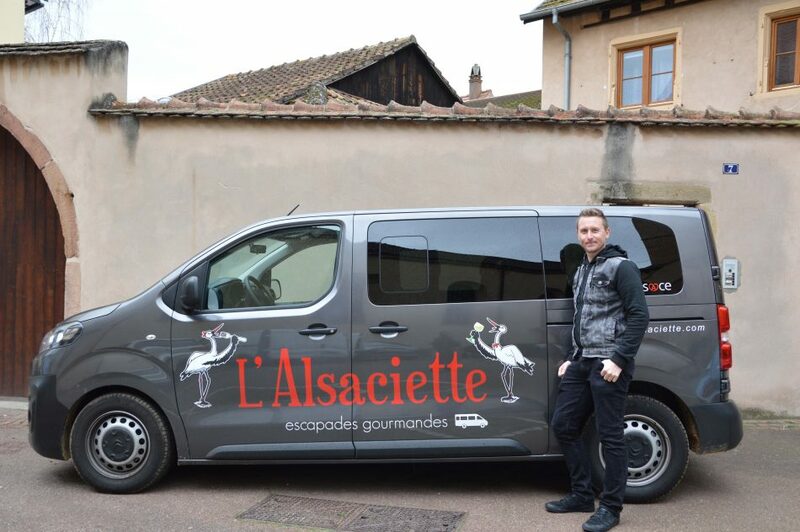 They have clean and comfortable vans driven by Agnès and Arnaud, experts in navigating the roads of Alsace. I don’t know how Agès and Arnaud seemingly know everyone in Alsace, but they do. Their naissance in the area, their professionalism, and the quality tours they take through the area has made them local celebrities. Walking down the streets and into shops, they received warm welcomes and friendly hellos from the people of the towns. Even stores and restaurants not included in the tour conversed with Agnès and Arnaud like old friends. First up was a sampling of some of Alsace’s famous food. A delicious, puffed pretzel with cheese was a warm and delicious. Next, pork rillette wrapped in a puffed pastry tasted like a traditional German meat wrapped in a French pastry. Perhaps that is marriage of foods in an area that has consistently changed hands every century. A raw salmon with poppyseed seemed like an Alsatian ceviche. I loved it! Another little bite, a pork, cheese, vinegar, and cornichon salad was a surprising delight. Tarte flambée, a cheesy, crusty, and light pizza type delicacy. Next stop. 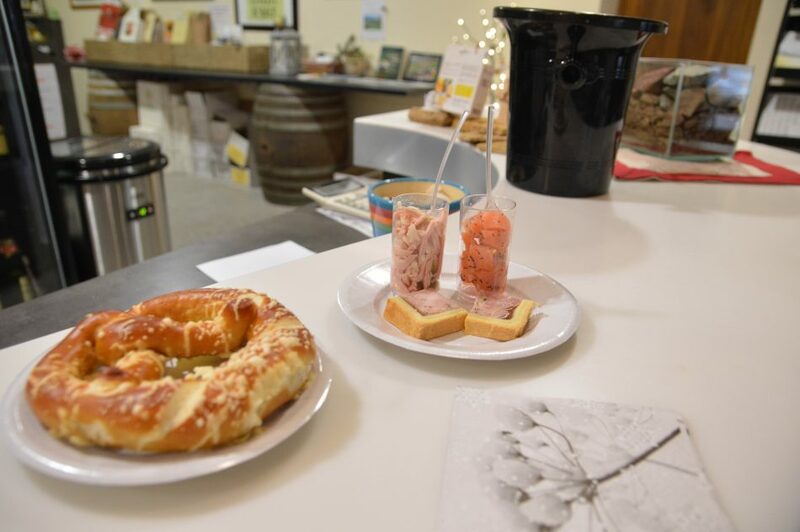 we had another pretzel, some fantastic cheese, and my first taste of the Alsatian cake known as kugelhopf. Similar to an Italian panettone, it was flaky with raisins but not overly sweet. The ideal accompaniment to an Alsatian Reisling or Gewurtztraminer. I have to admit: I didn’t think I was a big white wine fan. I tend to prefer red wine as a rule, so the opportunity to enjoy a glass of white wine doesn’t come up much. 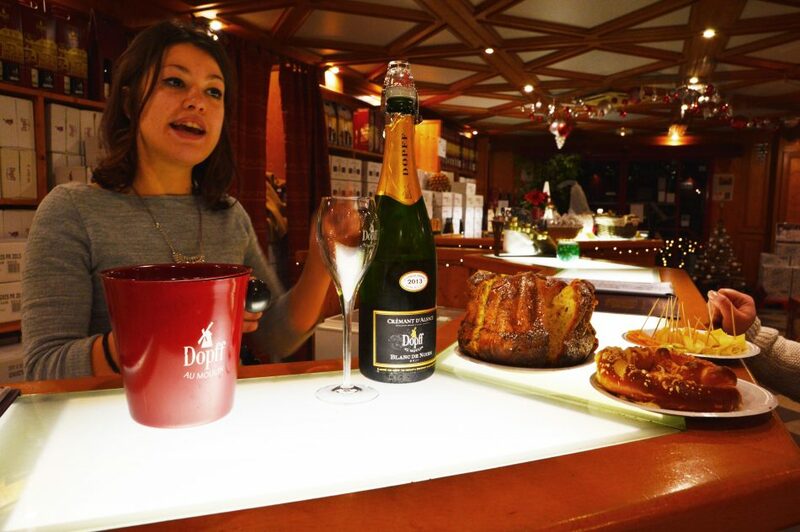 While in Alsace, you must partake in the fantastic wine of the region. With L’Alsaciette taking the lead–and doing the driving!–you can enjoy each tasting of Alsatian wine that comes your way. We stopped at two phenomenal wineries on my tour, Bruno Hertz and Dopff au Moulin. I tried wines I’d never heard of before, like Gewurztraminer, Cremant D’Alsace, and Muscat. Now, I can’t get enough of them! While I speak French, L’Alsaciette’s tours are offered in English, French, Spanish, and German. 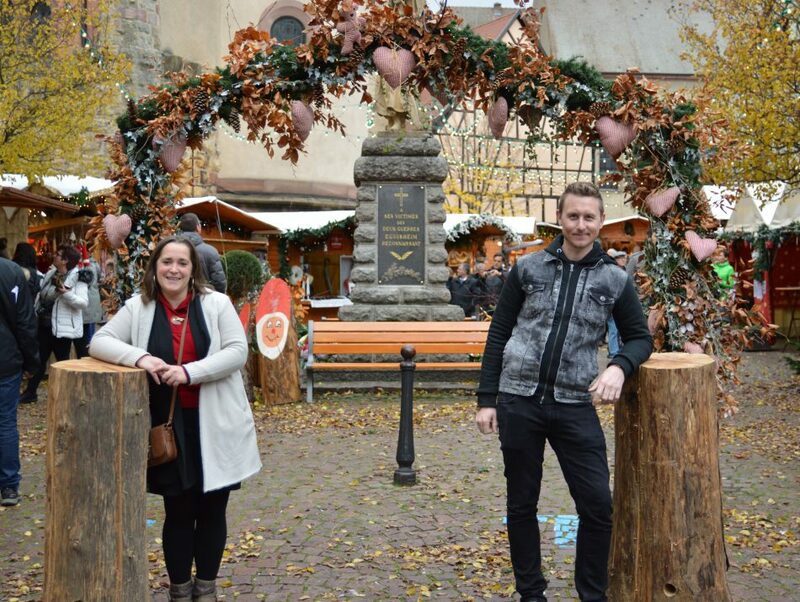 I visited Alsace in November, the first weekend of Christmas markets. 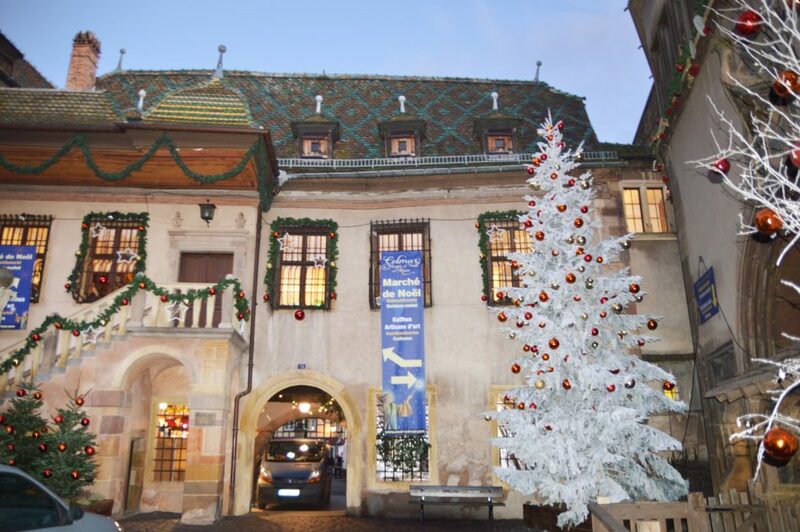 Alsaciette’s Christmas Market tour included visits to 4 different towns: Colmar, Eguisheim, Keintzheim, and Riquewihr. There are four other tours offered by L’Alsaciette, based on interests. There is the Munster Valley Tour that discovers the Vosges mountain range, the Alsatian Wine Route tour, the half day tour, and the Castles and Vineyards tour. While the focal point of each may be different, the quantities of delicious food and wine available in each remains constant. I truly enjoyed my time with L’Alsaciette and highly recommend you schedule a tour with Agnès and Arnaud if you find yourself in Alsace. Tours start in Colmar, at the train station. Very good article Jaime. We enjoed it a lot along with the video and fantastic photos. 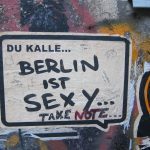 We like taking a food tour – also a wine tour when we’ve on holiday in Europe. So, we’ll keep in mind a food tour in Alsace as soon as we can make plans to return to Europe. Thanks for the info. 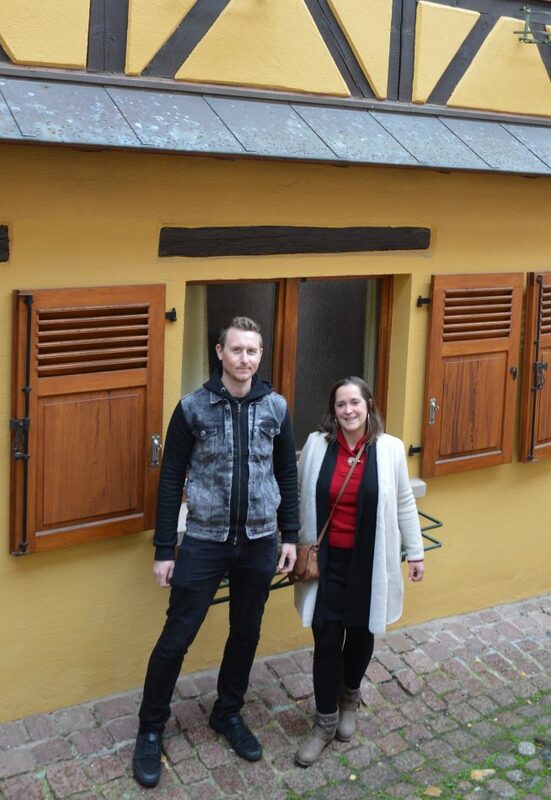 Thanks Michael–it was by far the best food and wine tour I’ve taken. So thorough, so fun, not too crowded. I hope you reach out to Alsaciette if you find yourself in the region!